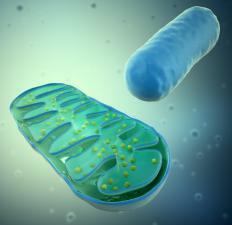 Cytochromes are found within the walls of mitochondria. Cytochromes are enzymes that contain iron in the form of a heme in their active site. They are involved with the transport of electrons during cellular respiration. A separate class is cytochrome P450s, which carry out detoxification reactions and synthesize compounds, such as steroids. Both types of enzymes are found in membranes. There are several different types of cytochromes, and these are distinguished in a variety of ways, including by spectroscopy and sensitivity to inhibitors. They are cytochromes a, b, and c — and each has subtypes. They vary in the environment that the protein provides for its heme group, and this affects the ability of the cytochrome to transfer electrons. The transfer of electrons is part of the respiratory cycle. Respiration takes place in all cells of the body, and provides energy in the form of adenosine triphosphate (ATP). This compound is a universal source of energy for cells. Energy-rich glucose is broken down in the mitochondria, which are the furnaces for the cells. The enzymes involved in the respiratory chain are located in the wall of the mitochondria. The electrons from the degradation of glucose are transferred, step-by-step, down a gradient of enzymes composed predominantly of cytochromes. At each step, energy is released. This is sometimes called the cytochrome system. The iron in the active site of the cytochromes varies between being in a reduced or oxidized form. The flow of the electrons occurs when they shift from a reducing agent to an oxidizing agent. The final step is the transfer of two electrons from cytochrome c oxidase to oxygen, which forms water. This step is coupled to ATP formation, and is known as oxidative phosphorylation. Proteins that contain heme groups are known as hemoproteins, and the hemes of some of the cytochromes differ from each other. Along with the differences in the protein structures, this helps ensure that the cytochromes have varying reducing potentials. Thus, they are located at different points in the respiratory chain, which are optimal for their electron transfer. These enzymes are also found in the membranes of the mitochondria, the endoplasmic reticulum, and in the chloroplasts of plants. Cytochrome P450s are an entirely different group of enzymes. Instead of oxidizing their substrates, they incorporate an atom of molecular atom. Thus, they are monooxygenases, not oxidases like the other cytochromes. They also have a heme group at their active site. P450s are a very diverse group of enzymes. There are a number of different types in the liver, where they detoxify foreign substances, such as drugs. These also detoxify many of the compounds found in the plants people eat. It is thought that many of these P450s evolved as a human defense against the toxic compounds found in plants. Other types of these enzymes are involved in the biosynthesis of steroids and hormones.